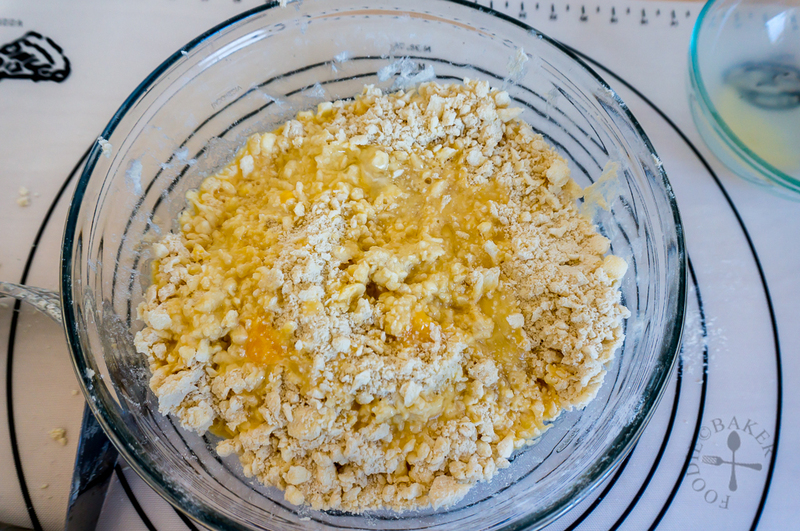 This basic pie crust recipe is my first pie crust recipe and I’ve used it quite a few times. I used to make it just with 100% butter but I found that making it with 50% butter and 50% shortening yields a flakier crust. 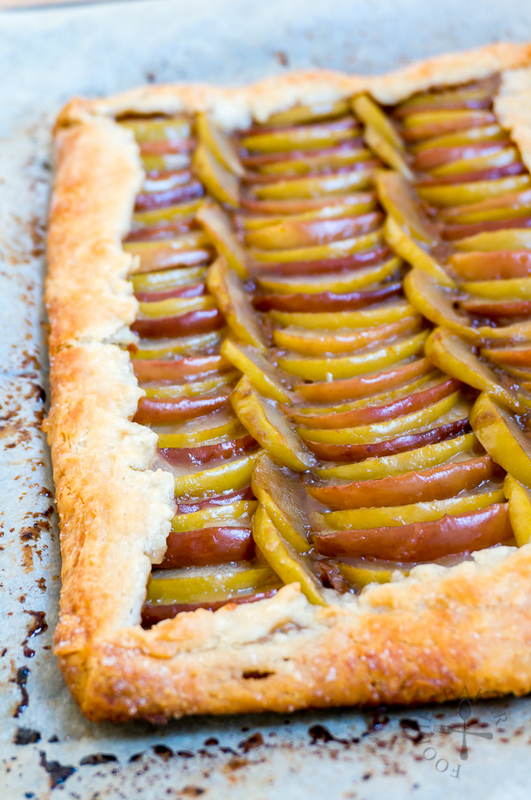 This is definitely not the perfect pie crust recipe as I found that it can be a little hard to handle sometimes as it tends to stick. But until I find a better one, this is the one I’m going to stick to! Whisk flour and salt in a large mixing bowl. 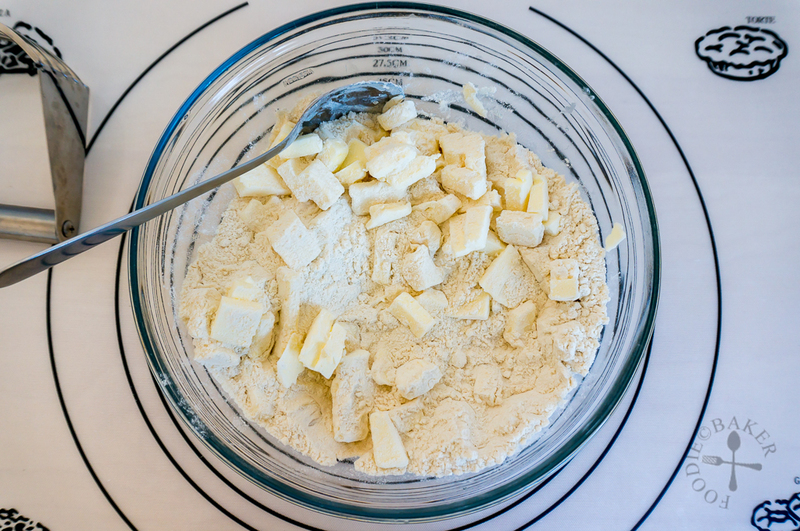 Cut cold butter and shortening into small cubes and add into the flour mixture. 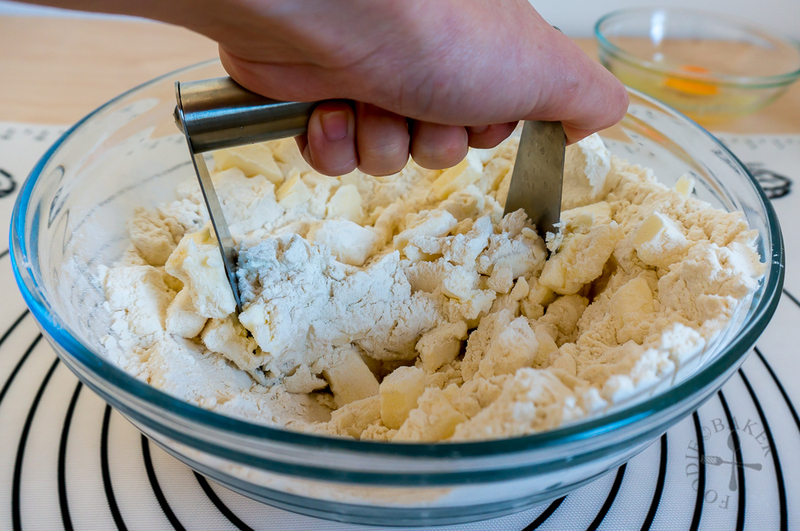 Cut in the butter and shortening with a pastry blender – use a spoon to dislodge any pieces stuck in the pastry blender periodically. It will be quite difficult to blend them together at the start as the butter and shortening are still cold. Whisk egg, vinegar and 1 tablespoon cold water together and stir into the large mixing bowl. Add in cold water teaspoon by teaspoon, if needed, so that the mixture is moist and comes together and hold its shape into a ball. Do not over-work the dough! 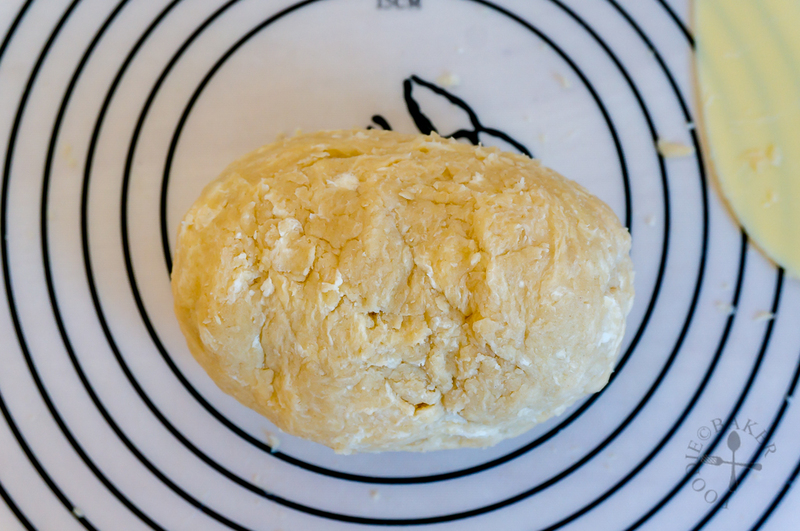 Divide the dough into 2, 3 or 4 portions, if desired, wrapping each portion with a plastic wrap and flatten gently. Refrigerate for at least 30 minutes before using it. Divided into 2 portions, each portion of dough is sufficient to cover a 9 or 10-inch pie dish. Divided into 3 portions, each portion of dough is sufficient to cover a 7-inch pie dish. Place flour and salt in a large mixing bowl. 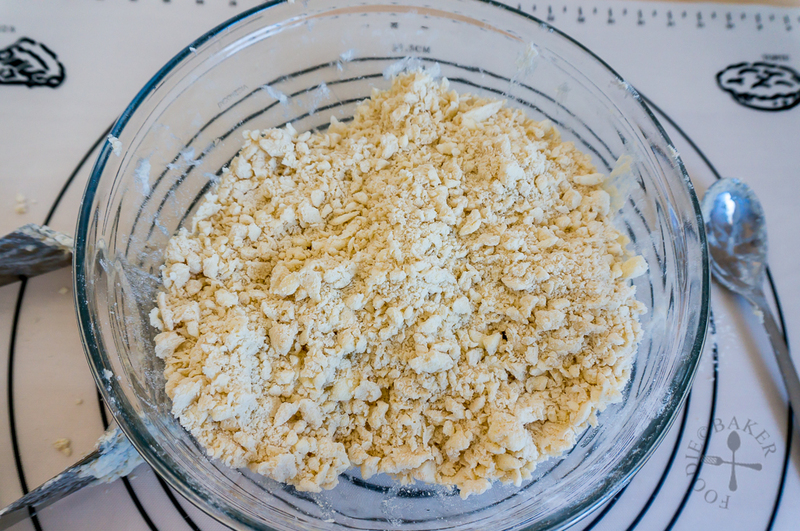 Add in shortening and butter and cut with a pastry blender until the mixture is a consistency of damp sand with a few pea-sized pieces of butter and shortening remaining. Whisk egg, vinegar and 1 tablespoon cold water together and stir into the large mixing bowl. Mix well. Add in cold water teaspoon by teaspoon, if needed, so that the mixture is moist and comes together and hold its shape into a ball. Do not over-work the dough! 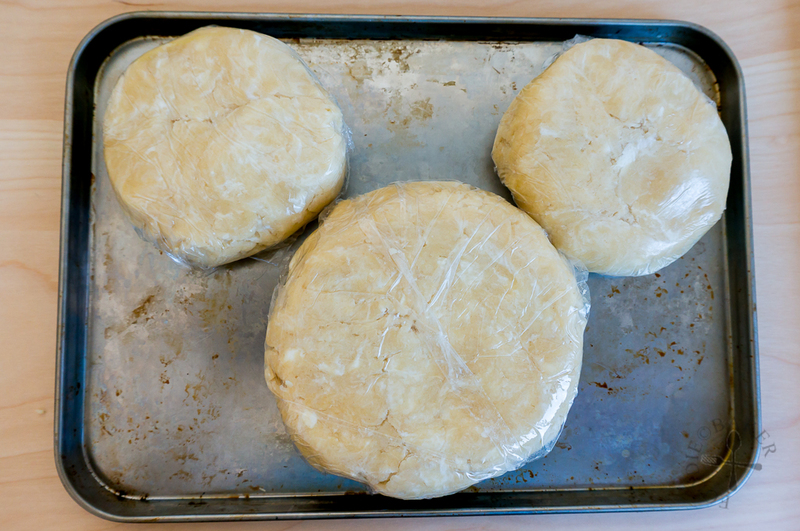 Divide the dough into 2, 3 or 4 portions, if desired, wrapping each portion with a plastic wrap and flatten gently. Refrigerate for at least 30 minutes before using it. If the dough has been refrigerated for hours or overnight, it may need to soften at room temperature before it can be rolled out easily. Divide the dough into required portions. Wrap with 2 layers of plastic wrap and freeze them. When needed, thaw the dough overnight in the refrigerator. Let it rest at room temperature for about 15 to 30 minutes before rolling it out. 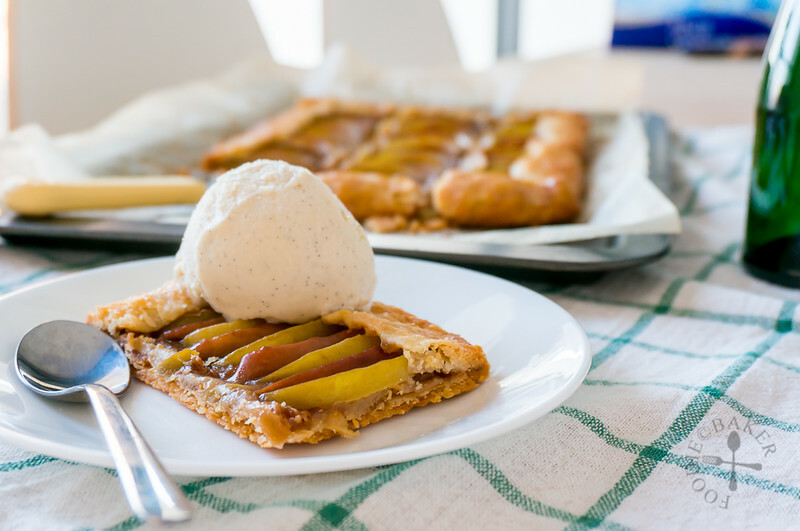 Alternatively, roll out the dough and line the tart tin, freeze the pie dough in the tart tin for at least 4 hours, then transfer it (tin and pie dough together) into a ziploc bag and freeze. Thaw the pie dough in the refrigerator overnight before using.